Plants and animals are NOT randomly distributed on our intertidal zone. Each living thing is generally found in a place that best suits it. Thus as you move from place to place on our shores, you may observe a change in the kind of plants and animals that you see. More about the intertidal. Changes are quite obvious as you move further away from the shore at low tide towards the water's edge. More about tides. If you visit at high tide or moderate low tides, the area may appear bare. This is because few marine plants and animals can tolerate being out of water for a long time. Parts of the shore that are seldom covered in water thus have fewer plants and animals. These zones of life are also obvious on a large boulder and on a rocky shore. 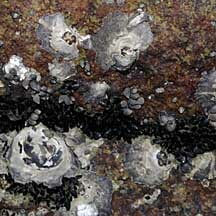 You can often see 'bands' of particular kinds of animals or plants settling on such a boulder. 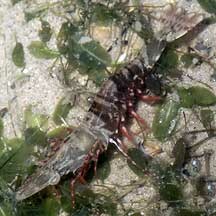 Immobile rock dwellers start life as free-swimming larvae. When settling down, these larvae compete for the a good spot, e.g., one that is less often exposed at low tide or is moist and shady. Each kind of animal survives best in a spot where it does better than its competitors. 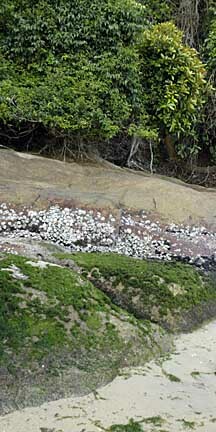 As a result, different kinds of animals are often found in distinct zones on a rock. This happens, for example, with barnacles. At low tide, areas that are more often covered in water may be exposed for a short time. Here, you might see a greater variety of plants and animals. Some animals, in fact, function best during this window of low tide. These include fiddler crabs, sand bubbler crabs and soldier crabs. Other less hardy animals simply hunker down and wait until the tide comes back in. Many hide under the sand, in holes and crevices of rocks and coral rubble, or shelter in pools. At very low spring tides, even more areas are exposed. These areas are almost always covered with water and are thus richer in marine life that do not tolerate being exposed out of water for long. Most of the bigger and mobile animals would have moved into deeper waters. But plants and immobile animals such as corals, sponges and large sea anemones may be seen. In places where pools of water collect, even more animals may be seen taking shelter. The spectrum of life: The different shore ecosystems are found in different zones: such as mangroves, seagrasses, sandy shores, rocky shores and corals reefs. The boundaries of each ecosystem are not clearly marked. Overlaps occur as one ecosystem gradually changes into adjoining ecosystems. The ecosystems impact one another and a shore with many different ecosystems tends to be richer in biodiversity. Many marine creatures spend different parts of their lifecycle in different ecosystems. For example, our favourite seafood such as shrimps and fishes may grow up in the safety of mangroves or seagrasses, before venturing out into the reefs as adults. They may return to the 'nursery' of mangroves and seagrasses to lay their eggs. different niches where they do best. as adults into other ecosystems. Why Tides? on the Fitzgerald Marine Reserve website: a wonderful animated gif shows you clearly how spring and neap tides happen. Tide Levels on Life on Australian Seashores by Keith Davey on the Marine Education Society of Australia website: about tides and how tide heights affect zonation. FREE photos of intertidal landscapes . Make your own badge here.